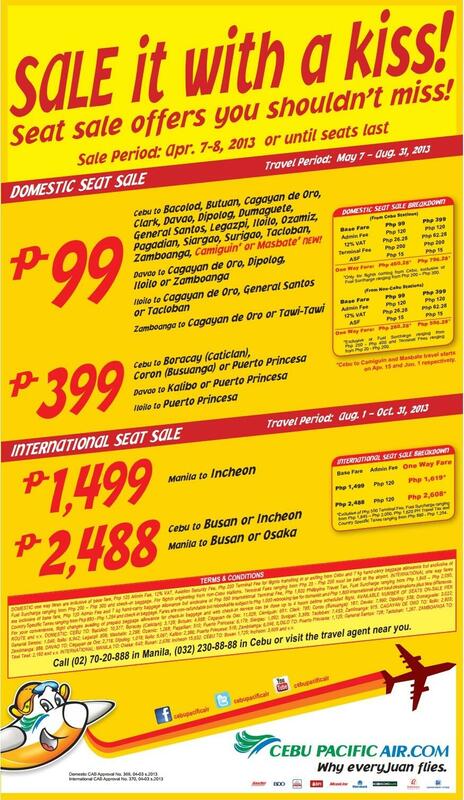 Local airline company Cebu Pacific is giving off discounted seats on selected domestic and international destinations. The travel period is from May 7 to August 31, 2013. If you have travel plans or ideas that suits that date range, then this is a perfect opportunity to avail a ticket at a huge discount. 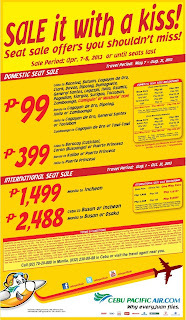 The tickets can be purchased online at Cebu Pacific website, www.cebupacificair.com or at their ticketing offices and official payment centers. The promo is until today only, April 8, 2013. As usual, promo tickets are limited. The fares shown in the promo poster above refers to the base fare. It means that you still have to pay other charges such as fuel surcharge, terminal fee, taxes and other miscellaneous charges. Make sure to check the breakdown of your final ticket price before purchasing it. Many are surprised to find out that the ticket already exceeded their planned budget.